Our aim was to design a keyboard for the ELB-02 that is easy to play, and the result is the FSB keyboard. This keyboard includes the Initial Touch feature where the strength with which the keys are pressed will affect the volume and the tone of the sound. It also has the After Touch feature where you can change the volume and the tone of the sound by adjusting the force applied to the keyboard after pressing the keys. The ELB-02 comes with a range of 540 quality Voices. It also features Super Articulation Voices where the keyboard can be used to add realism to your performance, such as pitch bend and glissando of wind instruments or natural sounds caused when fingers touch and mute guitar strings. Also included is a wide range of sound effects. The ELS-02 comes with a variety of 368 rhythm patterns. It includes percussion sounds and other effects that can be called up and played using the keyboards. A Registration Menu offers easy access to call up preset combinations of Voices and rhythms called "Registrations." There are a total of 601 different Registrations – 506 from the STAGEA Series plus an additional 95 basic Registrations specially created for even a beginner to use with ease. This extensive Registration Menu is categorized by genre to enable you to easily find the sound that you are looking for. The ELB-02 features two purpose-based recording functions. The design of the ELB-02 is simple and elegant, and comes in white to easily blend with any interior. It is fitted with a highly visible LCD widescreen monitor with a data control dial that is positioned to facilitate the selection process. 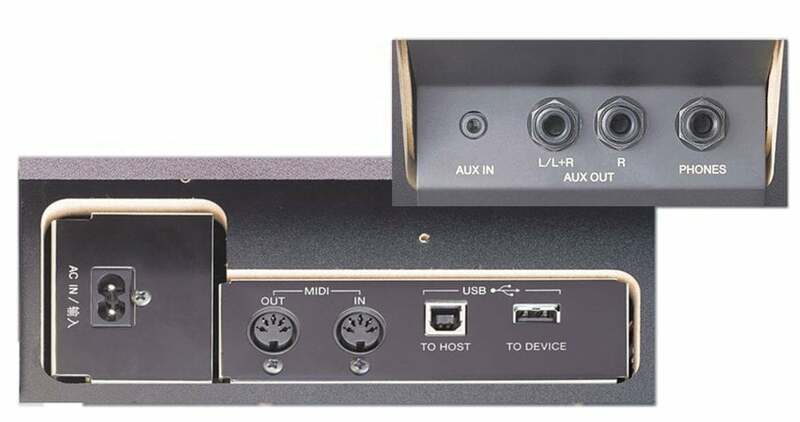 In addition to the headphone, MIDI and USB terminals, the ELB-02 also comes with AUX IN and OUT terminals. This means that your music can be recorded or playbacked by connecting the ELB-02 to a portable audio player. The ELB-02 is fitted with a 4-channel amplifier. Enjoy full dimensional sound from bass to treble. *Usually covered by a speaker net.